A new news reader has just come across my desk, and based on the few minutes which I could get it to work I think this could be a serious alternative to Google Reader. CommaFeed is a free news reader service that is strictly browser based at the moment. As you can see from the following screenshot, it offers a clean and minimalist alternative to the more colorful Feedly. Or at least it is supposed to offer a cleaner alternative to Feedly; I can't get it to work with any consistency. One of the nicer features of CommaFeed is that it will let you integrate your Google Reader account, which I did. Unfortunately, the service wasn't really intended to work with an account that follows over 2k RSS feeds, and I keep managing to break it. But this is probably a problem that is unique to me, so the service is probably worth a look. When Google announced Reader shutdown, I started to work on a clone. It is now available. It’s simple, bloat-free, and it’s open-source. Say hello to CommaFeed. CommaFeed currently has around 1,000 users (so said the developer in a tweet this morning), so this service probably isn't a serious threat to Feedly with its millions upon millions of users. But this could be still be a good alternative for someone. You can try it on the website, and if it fits your needs there are Firefox and Chrome plugins. CommaFeed is also open-source, so running your own version is also a possibility. 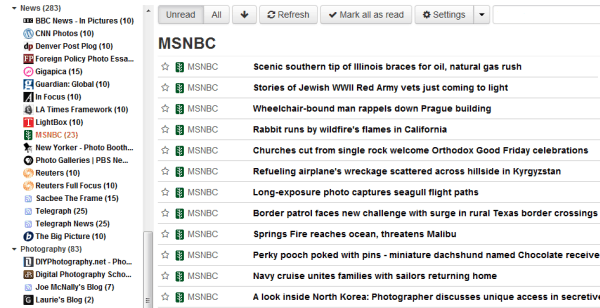 hey guys, you can also try http://www.ReaderLine.com, it’s very similar to google reader with a cool design. It’s a little odd to say we can try something when it has not been launched yet. Hey thanks for sharing this. I’ve finally imported my reading list to CommaFeed. I like how minimalistic it is. so yay!